One thing trailer owners tend to overlook is the importance of having a high-quality trailer hitch lock. They probably think that nobody’s going to take the time and attempt a robbery of something as big as a trailer. But we live in a crazy world, and there are many different instances of people making off with someone else trailer. And if these people merely had a high-quality trailer lock, this nightmare experience might’ve never happened. As a result, you should always ensure that your valuables are protected. After all, if you’re anything like me, I’m sure your store some incredibly essential stuff inside your trailer. The best trailer hitch lock will be an excellent protector of these valuables. With this in mind, we thought you could use an article that could help guide you toward these top-notch trailer hitch locks. In doing so, we plan on making your buying experience as simple as possible and provide with all the information you need to make sure you’re happy with your purchase. So please, read on and let us help you protect the things you hold most dear. In fact, I promise that once you’re done reading this article, you’ll know exactly what you want out of a trailer hitch lock and why you need one. In the product review section, we discuss what we consider to be the best available trailer hitch locks on the market. By doing so, it’ll help make you more comfortable with the options out there. 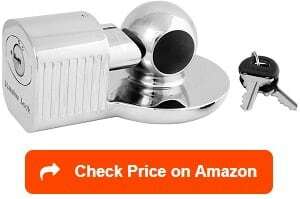 It will also help you understand what you should be looking for in a high-quality trailer hitch lock. Our first product, the Master Lock Receiver Trailer Hitch lock, is a high-quality option that comes from a manufacturer, which has a sterling reputation. And it’s products will appear multiple times on this list for a variety of different reasons. With this Master Lock trailer hitch lock, I love how they built this lock as its stainless steel construction creates an incredibly durable item that’ll help protect your trailer for a long time. It also is incredibly versatile as it’s capable of fitting class I to IV hitches, which makes it perfect for my class III hitch. And it can do this because of its locking pin hitch can fit both ½ and ⅝ receivers. Pretty cool, right? Well, the incredible features don’t stop there as it has a watertight cap that helps reduce the effects certain weather conditions can have on the integrity of the lock. I mean, I live in a rain nonstop kind of place, so this could really benefit my particular needs, and I’d imagine it would be beneficial to anyone regardless of the climate where you live. It also has a push to lock mechanism that makes this product extremely easy to use. But all these features couldn’t make this product perfect. Several customer reviews expressed concern about the flimsiness of the keys. It seems the keys accompanying this lock have a frequent tendency to break, which for someone like me, who’s rather careless, could be a significant issue. Otherwise, I didn’t see many issues being reported about this product. Therefore, if it meets the measurements of the lock you need as it does for me, I don’t see another reason why you shouldn’t at least consider this item from Master Lock. The Proven Locks Trailer Coupler Lock is the best trailer coupler lock we’ll review in this article. It offers everything a customer could be looking for in a trailer hitch lock and will do everything in its power to ensure your trailer doesn’t get stolen. It can provide this security for a rather simple reason; it has ¼ thick steel construction that has been described as bolt cutter proof. I mean, there’s nothing more you could ask for that this lock doesn’t provide durability wise. It’s also made from a US manufacturer, which for me is always something I like to see. If it’s made in the USA, I can take comfort in it being able to pass all the strict regulations the US has there companies go through. But the best part about this product is it’s incredibly easy to install. There’s nothing worse than buying a product than finding out you have no idea how to make the thing work. And given the praise, the installation process has gotten in the product reviews I doubt this will be an issue. The company even threw in a lifetime warranty just to make sure that you know how much faith they have in this trailer hitch lock. Honestly, this product might be the highest-quality item we review on this entire list. And that’s saying something because every lock here is incredible in its own right. Although this particular has one major issue that’s holding it back from being inside my Amazon cart right now, the price is ridiculous. It’s not even close to what I could realistically afford. 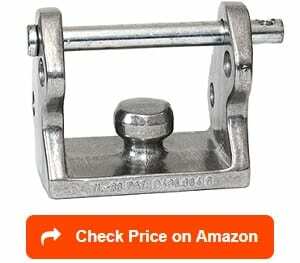 It’s a shame too because I really do think this coupler trailer hitch lock would be perfect for my circumstances. Our second Master Lock product, the Master Lock Couplers Trailer Lock 389DAT, has a lot of different features that I find appealing. And I wouldn’t expect anything else from this company as there’s not a lock they’ve made that hasn’t been of high-quality. The first thing that stands out about this lock is its versatility. I mean, it has universal size fits, which covers couplers ranging from 1-⅞ to 2-5/16 inches and everything in between. And since my needs fit into that range, I’m all aboard on this lock. But its versatility isn’t even the best part, this product unlike the one review before it, is actually affordable. As someone who doesn’t make the most money in the world, this reasonable price could help make this whole process a lot more manageable for me. It also helps that it does an incredible job at reducing the risk of rust and corrosion by being made from weather resistant material. However, the most unique feature about this item has to do with something entirely unexpected: the color. 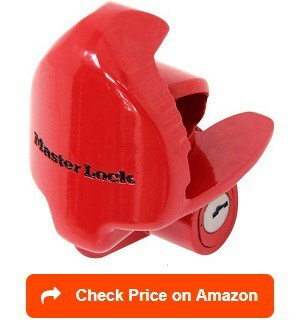 Master Lock had the brilliant idea of coloring this lock red, which makes it stand out in public. And by doing so, makes it much more unlikely that a thief would choose to steal it. In other words, the red coloring ensures it’s a much more difficult target for someone looking to hijack a trailer. But even with all these features, there’s one significant issue that makes me question this lock. It doesn’t have a unique key design, which means keys are roaming around out there with capabilities to open this trailer hitch lock; I just wouldn’t be comfortable with that as a customer. The Reese Towpower Tow ‘N Store Lock Kit comes with three different lock options that’ll surely cover whatever it’s you need in a trailer hitch lock. I mean, I don’t envision a situation where one of these three lock options wouldn’t be usable on your application. Given this versatility and amount of options, you’d probably expect this kit to be incredibly expensive, but it’s actually affordable. I mean, I was shocked when I first stumbled upon this deal from Reese, which is known for creating top-notch towing related products. Regarding the actual products, this kit comes with two receivers (one for class I & II hitches and another for class III and above hitches) and a coupler trailer hitch lock. All three have been proven useful by the numerous customer reviews praising their performance. The coupler hitch lock, in particular, was the one that stood out to me for various reasons. For instance, the heavy-duty steel bar is durably made and does so without being outrageously heavy, which is always a plus for me. It’s also brightly color which makes it a good theft deterrent as it’s easily noticeable in public places. This aspect will surely scare away anybody looking to quickly steal your trailer and meander away with it in a matter of minutes. But the coupler, in particular, has a significant issue that makes this product a hard one to consider; it was constructed with aluminum material. This aluminum material is known to be rather flimsy and could be destroyed with a few hammer blows. Therefore, if you’re looking for a coupler hitch lock, I’d look elsewhere. 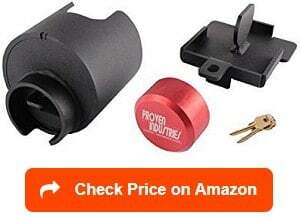 But if you are looking for a cheap option for a receiver trailer hitch lock, I’d at least consider buying this kit. Well, here’s a shocker; another product from Master Lock. The Master Lock Trailer Coupler Lock picks up where the other products from this manufacturer left off with its high quality. I mean, there’s very little I could complain about this fantastic trailer hitch lock. Honestly, the multiple application use feature alone makes this lock too versatile for someone not to at least consider. I know for a fact it’d work perfectly with my coupler and I’d imagine it’ll be ideally suited for yours as well. It also helps that Master Lock provides the consumer with a lifetime warranty, which makes me more comfortable with this particular item. I always enjoy a company who’s willing to expect fault in the case their product happens to malfunction. The fact it’s easy to install isn’t too shabby either and makes this whole process a lot easier. This particular aspect vaults this lock up toward the top of my list. I don’t need any new complications in my life, and this product doesn’t provide any. Plus, it’s affordable which is an essential piece of this whole puzzle. It’s even made from durable rust and corrosion resistant material, which is ideal for the rainy climate where I live. I don’t think I could just buy a trailer hitch lock that didn’t at least have some protection against these harsh conditions. But like the other Master Lock coupler lock, it doesn’t have a unique key design, and this factor doesn’t mesh well with what I wanted out of my trailer hitch lock. I want as much protection as possible for my trailer and a lock with a unique key design doesn’t provide that as much as I’d want. The Andersen Hitches Rapid Hitch Keyed Locking Pin is another worthwhile product anybody looking for a trailer hitch lock should consider. It has a stainless steel construction that makes it a top-notch product, which will meet a lot of customers needs. This stainless steel construction will also help it withstand any hammer blows a thief might try to bring upon it. Honestly, some customers stated how shocked they were by the amount of damage this product can take in light of a failed attempt at stealing their trailers. I also love how it’s able to fit both 2 and 2 ½ inch receivers, which is perfect for my class III hitch that’s in desperate need for a new lock. And if I do buy this product, I wouldn’t have to worry about emptying my bank account to do so as it’s plenty affordable. Which is somewhat surprising given the amount of effort Andersen Hitches put into creating an almost rust and corrosion proof product. It’s remarkable the amount of damage this lock can withstand even in the harshest elements. 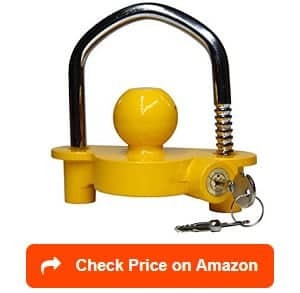 I’d feel extraordinarily confident bring this trailer hitch lock on the road with me as it’s more than capable of protecting my trailer and itself from any issues that might present themselves. There’s literally nothing about the product itself that I could find myself complaining about. I do, however, have one issue with the manufacturer of this product. According to the customer reviews, their customer service is downright bad as people would often complain about having problems even getting a hold of someone. This issue would definitely make me have second thoughts about buying this lock. In fact, it just seems lazy on their part. In an industry where most of the products have the same qualities, the BOLT Receiver Lock managed to have a unique feature. 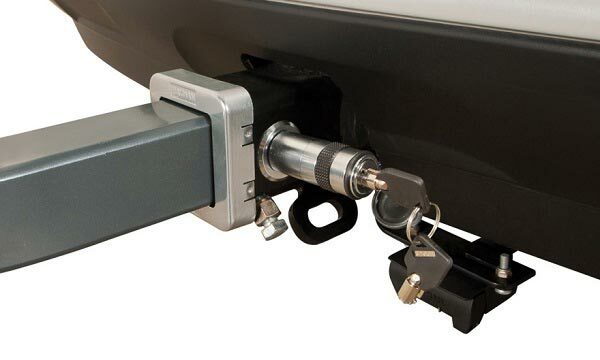 This feature makes this trailer hitch lock the most user-friendly option we have on this list. And the feature is this lock’s ability to remove the need for a separate key. See, if you’re lucky enough that your tow vehicle comes from one the following brands (Ram, Chrysler, Dodge, or Jeep), you can use your vehicle’s ignition key to lock and unlock this product. It might not sound like a big deal, but for a person that’s constantly misplacing things, I have to say this feature is incredible. Aside from this unique feature, this lock has others that are also worth mentioning. For instance, it has a stainless steel shutter that’ll prevent dirt and moisture from destroying the lock, which is always a plus. It also has a weather-resistant jacket that’ll further help reduce the effect the climate has on the performance of the lock. The lifetime warranty is also a nice touch that shouldn’t be overlooked; always nice to know a company has faith in its product. And they withstood the temptation of overpricing such a fantastic product, even added in an auto-return spring, which locks automatically once the key is removed, for good measure. In the end, BOLT did a fantastic job creating a product that stood out from the pack and made me wish I could buy it. But sadly, I don’t have a vehicle from one of those brands, which makes this product not a buyable one for me. Guess I’ll have to get myself a vehicle from one of those brands. 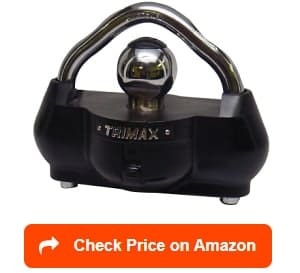 Our first, but certain not least product from Trimax, the Trimax Key Receiver Lock, has a lot of exciting features that I find to be useful in a receiver trailer hitch lock. The first being that its O-ring seal is absolutely fantastic. This O-ring seal can entirely keep water, grime, and dirt out of the locking mechanism; which is key to resisting the horrible effects that rust and corrosion can have on these products. Then, you add in the protective rubber cap, and this trailer hitch lock is ready to withstand the worst mother nature has to offer. I don’t there’s another lock on this entire list with this level of protection against weather conditions. In this capacity, this lock smokes its competition. It also does a pretty good job in another area, versatility. 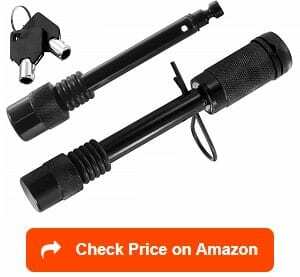 While it’s not the most adaptable item on this list, it does have the capability to be usable with all the higher levels of hitch classes (class III to class V). Plus, it has hardened steel construction that’ll ensure it stays useful for years to come. I doubt a person wielding a hammer could get through this receiver hitch lock without some serious time and effort, which most thieves aren’t going to put forth. But all these things Trimax did right is almost entirely canceled out by one pressing issue: the customer service backing it — several people complained about having problems contacting and reaching any person regarding installation or packaging issues. It’s just not something you’d like to see out a brand as highly respected as this one. However, I don’t think I could keep myself from buying this product because of it. 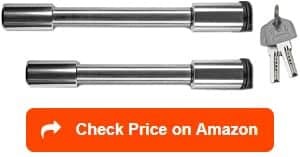 The Motormic Trailer Hitch Lock Pin Set is one of the most straightforward products to use on this entire list. It has a simple push to lock operation that even I could figure out quickly. I mean, a trailer hitch lock doesn’t get much simpler to use than this one. And they make it even more user-friendly by putting it all in a set that comes with various features to ensure everything goes swimmingly. Honestly, Motormic thought of everything when they put this set together. I can’t envision a customer who would be unhappy with the number of additional features you get with this purchase: 10 anti-rattle O-rings, two keys, extra long black, a safety clip, etc. All of this comes at an affordable price as well. I didn’t even mention how this product can fit every hitch class from I to V, which again, speaks to how user-friendly this lock truly is for the customer who buys it. It also has a steel construction, which conveys a sense of durability and that’ll this product will be in for the long haul. Plus, it has my favorite feature, the rubber cap, that protects the lock against any dirt or grime that tries to weasel its way into the locking mechanism. 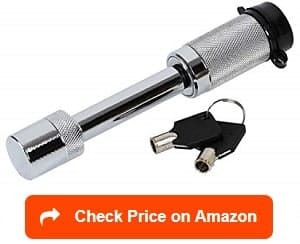 Everything about this particular product is top-notch and would be a worthwhile purchase for anyone looking for a trailer hitch lock. But there was one thing that popped up rather frequently in my research that was a little concerning. Multiple customer reporting packaging issues when they received the item in the mail: words like torn and damaged where common. Just a little issue to think about before you make your final decision. If you asked me, I’d take the risk even with the packaging given the quality of its performance. The Cocoweb Chrome C-Lock Heavy Duty Locking Hitch Pin comes in two different sizes: ⅝ pin or ½ pin. I kind of like having a choice I can match precisely with my required pin size rather than relying on a universal pin meeting my needs. It gives me a little more faith that the lock will actually fit perfectly rather than too loosely like some of the universal sized ones are known to do. I also like how Cocoweb equipped this lock with a barbell locking mechanism. This feature also further secures that the lock will fit snugly around the hitch. Anything that keeps the hitch tightly secured is a positive in my book, and these two features accomplish this aspect entirely. The easy installation is another quality I like in this model. All you need to do merely slide it in, lock it, and you’re good to go without any drilling or mounting necessary. It’s simple and straight to the point without any complicated issues just what I‘m looking for in a trailer hitch lock. Other than those features, there isn’t much more to say about this model that hasn’t been discussed in the other reviews: it supports the I to IV classes, has a weatherproof cap to fight against corrosion/rust, and is affordable. But there was one negative thing about it that did need a mention; even with the weatherproof cap, this particular lock has made some customers crazy with the quick formation of rust. This isn’t ideal or something I want to see with the lock I intend on buying. 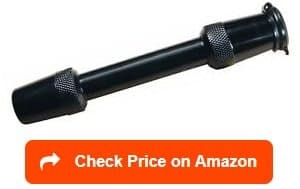 Therefore, this particular product doesn’t need my needs, but it could represent a good value for someone looking for a trailer hitch lock for limited usage. The Trimax UMAX100 Premium Universal Trailer Lock is one of our most durable products mentioned in this article. Its hardened steel construction would make any thief think twice about trying to steal your trailer. Honestly, you’d have some serious issues trying to break this lock with a couple of hammer blows. It would take a whole lot of effort and time; something thieves generally don’t have when they’re trying to pull off a score. Further complicating the thief’s intentions, this lock has type A key that’s spring loaded and has a seven-pin high-security key. In other words, this key isn’t part of some mass produced lock design: it’s relatively unique. As someone who is uncomfortable with the idea of not having unique key designs, this feature is something I appreciate. Speaking of things I appreciate, this lock also has ballistic grade nylon housing, which can absorb multiple hammer blows. All of these features just sound like a thief’s worst nightmare and isn’t that what we would want out of a lock? It seems Trimax did an incredible job creating a top-notch product ready to protect our valuables at all cost. But the cost is also where everything comes apart for me with this product. See, this model is rather expensive, and I couldn’t see myself spending so much on a product such as a lock. It just isn’t something I want or should need to do. However, if you have money to throw around and looking for the best of the best, this trailer hitch lock should be the near the top of your list. It’s got everything you could want in a product such as this and includes a little extra stuff you didn’t even know you wanted. Our last product, the Blaylock TL-33 Coupler Lock isn’t anything special, but it does its job effectively. 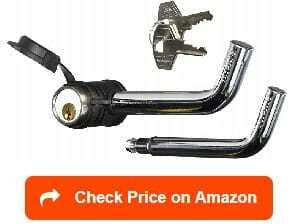 It also has some qualities that make it worthy of consideration for anyone looking for a coupler lock at a fair price. First off, it’s made in the USA, which means it passed through burdensome regulations; therefore, you know it’s a safe and usable product. It also has a heavy-duty steel locking rod that’ll stand the test of time without any issues regarding rust or corrosion. But the best part is this coupler lock has three hole positions, which allows you to decide the position that works best for your situation. As a consumer, I always like having multiple ways I can use a product, and these three different hole positions give me some options. The fact that this coupler lock is affordable is another nice touch. I mean, if you can’t afford the product, all the features in the world don’t matter. But thankfully, the price isn’t an issue with this model, and I can confidently say this is reasonably priced. However, there was one aspect of this particular lock that I don’t like; it’s aluminum construction. This type of material is lighter than steel, but it’s also more susceptible to hammer blows. Therefore, I’d much prefer a lock made from steel or hardened steel material. 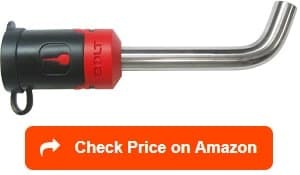 All in all, this product from Baylock is high-quality, but I don’t know if I feel comfortable buying a lock that I wouldn’t have complete faith in regarding its performance. I think I’d have to pass on this particular model. With any product you’re researching, there will be certain things that’ll decide whether an item is high-quality. And trailer hitch locks aren’t going to break this mold as there are certain things you must look out for when trying to find the right trailer hitch lock for your needs. This section will discuss those things in great detail to ensure you know exactly what looking for in the trailer hitch look that you end up buying. Just like with RV’s, your hitch has its own class. These classes range from class I to class V and not all hitch locks with support up to all these classes. In most cases, trailer receiver locks will either use ½ or ⅝ inch pins, and you’ll need to ensure that your hitch will work with these locks. 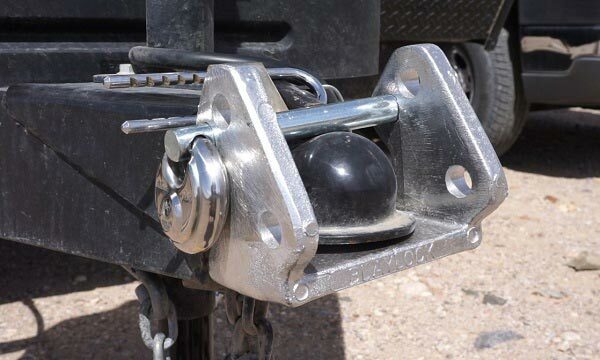 If you have a class II hitch, you’re usually going to need a trailer receiver lock with ½ inch pins. On the other hand, if you have a class III to class V hitch, you’re typically going to need a trailer lock with ⅝ inch pins. And as you might expect, if you get wrong size pins, you’ll have a hell of a hard time locking your hitch. In fact, the trailer lock hitch will be rendered useless unless you ensure it fits according to your parameters that your hitch requires. You’ll also need to determine the size of the receiver on your vehicle/hitch and match it to the corresponding lock as well. Generally, you’ll need a 1-¼ receiver lock for class I or II hitches, and a class III receiver or larger typically need a 2-inch receiver. If you don’t, you might end up buying a product you can’t even use. Meanwhile, if you’re looking for a coupler trailer hitch lock, you can determine which one you need by matching it to your coupler’s ball size. If the ball is 2 inches in diameter, then you’d need a coupler lock that’s 2 inches as well — most trailer coupler’s ball size range from 1 ⅞ to 2 5/16 inches, which most universal trailer coupler hitch locks will fit. But it’s still a good idea to know the exact size of your coupler that way you get the one that’s the best fit for your needs. It’s never a good idea to purchase something without taking everything into account. So please, before you end up buying a trailer hitch lock, make sure you’re getting the right size. Don’t be fooled into buying a receiver or coupler because it says it’s universal and fits any hitch. Instead, read the customer reviews and the product description, so that you know for sure before spending money on it. After all, you don’t want to be wasting money on a product you can’t use. It makes no logical sense. The material that the lock is made out of goes a long way in determining whether it’s a high-quality product or not for you to buy. The high quality trailer hitch lock will be made from some sort of high-quality or hardened steel. These two materials will have the ability to make it incredibly tough for a would-be thief to try and steal your trailer. If you have a lock made from these materials, it’ll make the thief think twice about trying to mess with your belongings. Some lock manufacturers might promote the use of lighter materials like aluminum highlighting their lightweight capabilities. But you should stay away from these products as their lighter weight makes them much easier to bypass. In other words, they’re easier for a thief to damage and makes your trailer a more straightforward target for them. Honestly, if your trailer hitch lock is made from something like aluminum, it’s most likely only going to take a couple of hammer strikes before it malfunctions. Some hitch locks use a key that can be used for several products from the same manufacturer. These companies do this because it makes these items so much easier to mass produce. However, it creates another issue for the customer. Let’s say a person get their hands on one of these keys. This person now has access to whatever products have that lock design, which makes their ability to steal your trailer much easier. But thankfully, some of these trailer hitch locks have keys that are uniquely designed so this doesn’t become an issue. As a consumer, there’s no way I’d even consider a trailer hitch lock that didn’t have a uniquely designed key. After all, you want to limit the chances your trailer gets stolen anyway you can. And getting a trailer hitch lock with a uniquely designed key is a vital step to keeping your trailer in your possession. Some trailer hitch locks aren’t going to last long in certain climates. It’s essential you find a product that can withstand even the worst weather conditions. For instance, some locks will corrode or rust a lot faster than others, which could cause the lock to seize. In doing so, the lock will end up malfunctioning and become useless for the purpose that you bought it for; therefore, you should check the customer reviews to ensure the lock you’re considering doesn’t have these types of issues, primarily, if you live in harsher climates. Trust me; if it does, customers will have complained about it. I mean, there’s little that’s more frustrating than a rusted lock. It just creates issues no customer would want to deal with during their RV trips. It’s also a good idea to make sure the lock has a waterproof cap for the keyhole before you end purchasing. This feature will also help reduce the risk that your lock ends up a victim of rust. These features also speak to the quality of the product you’re looking at. All in all, a good trailer hitch lock will do everything in its power to protect itself from corroding and water damage. Aside from the things you should be looking for, there are some other factors that you must consider before buying your trailer hitch lock. And in this section, we’ll cover those topics with the goal of providing you with all general knowledge you’ll need to make the right buying choice. What is a trailer hitch lock? Trailer hitch locks are designed to do precisely one thing: stopping thieves from running off with your trailer. In most case, these locks keep your trailer hitch and receiver together until you unlock it, which is typically done with some kind of key. These devices essentially prevent anyone who doesn’t have the key from lifting the receiver. 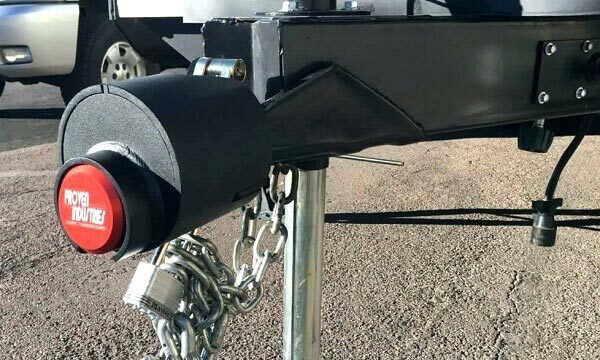 Without lifting the receiver, the person looking to steal your trailer won’t have the capability of unhitching your trailer. Overall, a trailer hitch lock is the best insurance policy against would-be thieves. I mean, without one these locks, stealing your trailer would be incredibly simple. All someone would have to do is hitch it onto their truck and be on their merry way. But I must inform you that a trailer hitch lock won’t completely stop a person from stealing your trailer. These devices are merely a deterrent, and some of these devices will likely cause the thief enough trouble that you’ll catch them in the act, or they’ll simply stop trying. As mentioned previously, these locks deter would-be thieves from attempting to steal your trailer. The way these products work depends on the type of trailer hitch lock you’re referencing. With most trailer hitch locks, they can be classified into one of two categories: coupler hitch locks or receiver-style hitch locks. For a coupler lock, you’ll have your trailer disconnected and the fit the ball into your trailer hitch coupler. Hence, where the name coupler hitch lock comes from with these products. Once the ball is in place, you’ll fit the bar or rod over the hitch assembly, which then you will lock into place. And after it’s locked into place, anybody looking to unlock will need the unique accompanying key. Now, a receiver-style hitch lock is a little different. As you might expect from the name, a receiver-style lock functions around your vehicle’s receiver. Before putting the lock to use, you’ll want to make sure your vehicle’s receiver is in place. Once it’s is in place, you slide the bar through the hole in the mount and the receiver. After pushing the bar through, you’ll then attach the locking side, which will secure the receiver. With this done, your trailer is now safely secure from all the vandals in the world. Of course, there are offer models that work differently, but these two examples represent the majority of how a trailer hitch lock will secure your trailer. It doesn’t sound too complicated, and it isn’t, which is why it’s a wonder that more trailer owners don’t have these beautiful devices. What are the different types of trailer locks? As you now know, there are two main types of trailer hitch locks: coupler hitch locks and receiver-style hitch locks. But the difference between these two types goes a lot further than merely how they work as we discussed above. Receiver style hitch locks are usually metal pins with locks on the ends. Some models have two locks on either end, and others have a curved end that makes it incredibly difficult to pull them out; either design is effective in deterring the efforts of thieves. All in all, these hitch locks are supposed to protect your trailer from being stolen when it’s hitched. But once your trailer is unhitched, these locks become effectively useless. So before buying this type of hitch, ensure you’re not going to be unhitching in an area where your trailer is stealable. If you’re just going to leave your trailer unhitched in your driveway, buying a receiver style hitch lock wouldn’t make much sense. But if you’re on the road a lot, these locks could be an incredibly useful accessory to have around. After all, you never know when someone’s going to think that stealing your trailer is a good idea. Unlike receiver-style hitch locks, coupler hitch locks can protect your trailer when it’s unhitched and sitting in your driveway. See, these U-shaped locks fit over the coupler on your trailer’s tongue, which will ensure a person would have a difficult time hooking up to their vehicle. These locks usually have ball-shaped tops, which go where the ball unit on your towing vehicle would typically be placed into the coupler. As a result, these locks make it incredibly difficult for someone to hook their towing vehicle into the hitch. If you’re looking for a lock that’ll keep your unhitched trailer safe, these products would be the ideal option for you. In other words, if you plan on storing your trailer in your driveway for a significant period, it’d be wise to invest in the best coupler hitch lock available. Why do you need a trailer lock? You need a trailer hitch lock to keep your trailer safe and in your possession. It’s as simple as that, and without one, you could fall victim to someone else’s greed or stealing tendencies. And since these types of crimes seem only to be going up, it has slowly become a must-have accessory. It also becomes quite clear you need one of these products when you consider the items typical being towed: jet-ski, RVs, boats, etc. All these items would be a complete hassle to replace and cost you a massive amount of money. But with a trailer hitch lock, you’d at least have some protection against a person willing to try and steal your precious cargo. Don’t be the person who’s ill-prepared for the mischievous actions of another human. Instead, make their attempt to steal your stuff as difficult as possible by having the best trailer lock available. Honestly, you’d be surprised how useful these devices are to have around just in case the nightmare situation of somebody trying to rob your trailer ends up happening. I promise these locks do make a difference and the prices they tend to cost won’t clean out your bank account. In fact, most of them are incredibly cheap and affordable even the high-quality ones as you’ve seen from our product review section. Any good FAQ section will do one thing and do it well: answer any other remaining questions you have about the topic at hand. And this one will be no different as we’ll try to address any other remaining concerns you may have about the world of trailer hitch locks. What are good trailer lock brands? Like with all products, there are high-quality, and low-quality manufactures. And trailer hitch locks are no different, but these factors are especially relevant for these products as they’re the only thing preventing your trailer from being stolen. Any of the three brands below will be able to provide you with a product that’ll keep your valuables safe and give you peace of mind. Now, my choice of these four brands to single out doesn’t mean the others listed in the product review section are low-quality. In fact, it’s quite the opposite as those brands also represent everything you could want in a trailer hitch lock manufacturer. It just these four brands are my absolute favorite, and the companies I’ve felt had the least issues as I’ve done my research. How to lock trailer hitch? Well, it depends on the model of trailer hitch lock that you end up buying. Both coupler and receiver locks typically operate how I described them above in the “how does it work” portion of this article. But if you’re still confused about how to lock it, etrailer has an incredible series of videos on YouTube that go over the ins and out of how to lock whatever hitch lock you’ve bought. I mean, here’s an excellent example of them demonstrating how to use Master Lock Trailer Coupler Lock. Now, once you have the hitch lock secured, your hitch is locked and ready to keep your trailer safe from any people looking to steal it. And just for comparison sake, here’s a video demonstrating how to lock a hitch using a receiver hitch lock, the BOLT Receiver Lock. Looks pretty easy, right? Well, it is, and if you type your specific model into google, a video similar to these should pop right up that’ll help you out in case of any issues. In fact, I just did it with all the products mentioned in the product review section, and each one has a video showcasing how to use it on YouTube. All in all, it isn’t as difficult as you might think. And if you have any issues, never hesitate to call the manufacturer or have a professional look at it. Either one should have the answers to any question you might have about your new trailer hitch lock. How to unlock a trailer hitch lock? As you’ve no doubt learn through this buying guide, talking about trailer hitch locks in general terms isn’t very easy. But regardless of the model, it’ll typically be a simple, natural process that even mechanically challenged individuals like myself can do. For example, let’s take a look at the Master Lock Trailer Coupler Lock from the product review. To unlock this trailer hitch lock, you turn the key. The turning of the key will trigger the slide coming out where the ball would be in the coupler, and it disconnects. In most cases for receiver trailer hitch locks, like the Trimax Receiver Lock, you simply put the key into the lock core and start turning the key counter-clockwise. You do this until the end piece detaches from the rest of the device. Honestly, there’s nothing too complicated about these products. But if you do have issues, all the instructions about unlocking the product should be in the manual that was sent with it. If not, there should be a video somewhere on YouTube that accurately depicts how it’s done. How easy is it to steal a trailer? Whether or not your trailer is easy to steal is entirely in your hands. For example, let’s say you leave your trailer in your driveway without it being attached to anything, there’s high-probability it’d be easy for a person to steal. Another example would be if you’re towing your trailer and you stop, and you don’t have a trailer hitch lock, a person could easily just come over, hitch to their vehicle, and be on their way. You might be shocked to learn that even people with fifth wheel trailers have had these type of issues too. All a thief would need to do would be get pass the jaw mechanism while you aren’t looking and take it with them. As you can see, without the resistance provided by a high-quality trailer hitch lock, stealing a trailer isn’t the most challenging process. In fact, it’s relatively easy and simple, which is why it’s become more prevalent over time. The more unique the key, the less likely your trailer will end up stolen. As previously mentioned, some companies will mass produce different types of locks that’ll use the same key, which could make taking your trailer a simple process of matching a mass-produced key to your lock. Due to this, you should focus your search toward products with unique keys or brands that mention they have a thousand/millions of key combinations. Either one will severely reduce the risk that you get your trailer stolen, merely because a thief has myriad of keys that they could keep trying until they find a matching one. Ensuring the trailer hitch lock that you buy can withstand a few hammer blows is another way to further prevent your trailer from getting stolen. See, a thief will try using blunt force to break through the lock. In some cases, a few hammer strikes could do enough damage especially with locks made out of zinc or aluminum. As mentioned above, making sure your lock is made from some sort of hardened steel is a vital piece of keeping your trailer in your possession. Most of the time, if a lock is unordinary cheap, there’s going to be some flaws with it. But with a protection product such as a lock, these flaws become very problematic. In these cases, these flaws would make it easier to steal your trailer. Honestly, you shouldn’t hunt for the bargain buys with these products. It will only lead to you purchasing a malfunctioning item that could put your valuables in the hands of someone else. So please, find a high-quality lock and pay whatever you find reasonable to secure it. Park near large obstacles that’ll make the process more difficult. 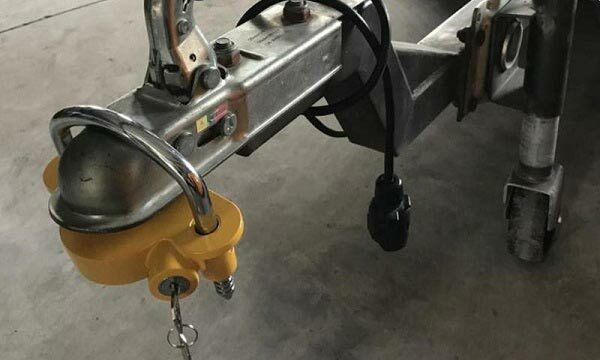 Doing these five things and buying a high-quality hitch lock, should be enough to prevent any person from seeing a stealing opportunity of your trailer. But if you still feel like additional security is needed, some people have extended their car alarm to their trailer. The extended car alarm would work exactly how it would work with your car; however, if anybody messes with your trailer, it’d now make that annoying sound that we all hate too. Honestly, there might not be a better way to prevent someone from stealing a vehicle than an annoying car alarm sound. But these alarms can get quite expensive, so, it would be a luxury purchase. And it’s not really needed as the five things I listed above along with the trailer hitch lock should be able to keep your trailer in your possession. Finding the right sized lock can be tricky business as the process is different for both types of trailer hitch locks. For a receiver trailer hitch lock, you’ll need to measure the receiver on your vehicle and the hitch pins hole. You’ll then use those measurements to find a corresponding lock. For class I to II hitches, you’re generally looking for a lock with ½ inch pins and 1-¼ receiver. If your hitch is class III to V, you’re going to need a lock with ⅝ inch pins and 2-inch receiver. And if you’re looking for a coupler trailer hitch lock, you’ll determine the size by measuring your coupler’s ball. If you have a coupler with a ball size of 1 ⅞ inches, you’ll need a coupler trailer hitch lock at the same measurements. Once you get your correct measurements, the shopping part of this whole process will become a lot easier. After all, with these parameters, all you have to do now is find a high-quality that matches them. After all this new trailer hitch lock knowledge you’ve gained, you’re now ready to move onto the best part: deciding which product is the best trailer hitch lock for your needs. Trust me; if you follow all the information laid out in this article, this buying experience should be a piece of cake. But please make sure you get a trailer hitch lock that’s built sturdy enough to withstand a hammer blow. There’s no point in spending any money on a zinc or aluminum made lock that’s just going to break the first time a thief strikes it. It just wouldn’t make much sense now, would it? So do me a favor and spend a little extra to ensure you get a high-quality product that fits your needs perfectly. Don’t pick something based on it being low-price; it’s just asking for a disaster to happen. I found your article because I’m looking for a better coupler lock. I had the Trimax umax100, within a few months the lock malfunctioned, the key wouldn’t go into it just minutes after I had locked it up… I was in a campground and I needed to move the trailer! I’m pretty good with locksmithing but was unable to get the lock to work. I figured the only thing I could do with what limited resources I had available to me was to break the lock. Having no hammer I employed the ball mount receiver. I gave it a medium sized whack just to warm up and make sure my aim was good. Imagine my surprise when the lock sprang open! My faith in this lock is totally gone. Rvweb.net is a participant in the Amazon Associates Program, an affiliate advertising program designed to provide a means for sites to earn advertising fees by advertising and linking to Amazon.com. Copyright © 2019 The RV Web Network. All Rights Reserved.